These famous words are now synonymous with the dynamic husband-and-wife team Chip and Joanna Gaines, stars of HGTV’s Fixer Upper. As this question fills the airwaves with anticipation, their legions of fans continue to multiply and ask a different series of questions, like—Who are these people?What’s the secret to their success? And is Chip actually that funny in real life? By renovating homes in Waco, Texas, and changing lives in such a winsome and engaging way, Chip and Joanna have become more than just the stars of Fixer Upper, they have become America’s new best friends. 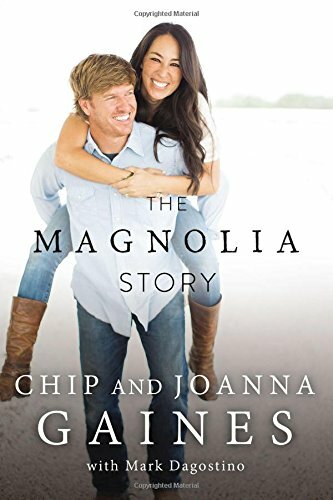 The Magnolia Story is the first book from Chip and Joanna, offering their fans a detailed look at their life together. From the very first renovation project they ever tackled together, to the project that nearly cost them everything; from the childhood memories that shaped them, to the twists and turns that led them to the life they share on the farm today. I loved this book! I bought it for my oldest daughter for Christmas and then we kind of all fought over who got to read it first. Since it was her book, she won that debate. Grace read it next and loved it. I finished it and I agree with both of them. It is a great book. It was an easy read, but a good growing business memoir type book. If you like their show at all, I think you will enjoy learning more about their story. One of the things that I enjoyed about this book was the reminder that nothing in life comes easy. We tend to look at successful people and think something like, wow I wish I had that or they have it so easy I wish my life looked like that. The reality that we often forget though is that the life we see didn’t happen overnight. It takes work. It takes trial and error. It takes failures. And it takes more work to get to that. We often only see the success of people, not what went into making that success. This book helps show what went into the success of Chip and Joanna. One of my favorite quotes from the book was this one. Whether you are in an eight-hundred-square-foot home or living in a dream house on a lake, contentment is found on the way to the “farm” not on the “farm” itself. There is so much truth in that. We don’t find happiness in the thing. It is the journey to the thing that makes us who we are not the thing itself.